1. 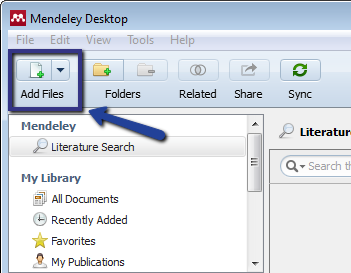 Drag and drop a PDF into Mendeley Desktop. 2. Click the "Add Files" button the far left of the toolbar. Mendeley detects document details and bibliographic data automatically when PDFs are added to generate citations. If there are document details for which Mendeley is uncertain, you may be prompted to manually verify and review information.